This double room has a dining area, tile/marble floor and microwave. 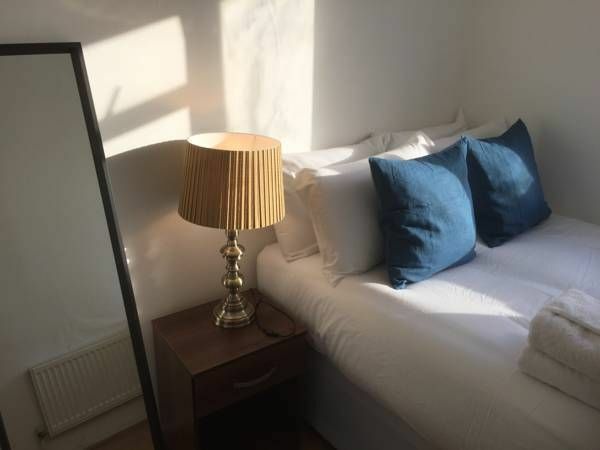 Conveniently located in the Tower Hamlets district of London, Guesthouse Stepney Green is located a 20-minute walk from Brick Lane, 1.2 miles from Victoria Park and 1.6 miles from Tower Bridge. Free WiFi is available. At the guest house, all rooms come with a wardrobe. Featuring a shared bathroom, certain rooms at Guesthouse Stepney Green also feature a balcony. All guest rooms in the accommodation are equipped with a TV and a hair dryer. The nearest airport is London City Airport, 4.3 miles from Guesthouse Stepney Green. Tower Hamlets is a great choice for travellers interested in city trips, monuments and sightseeing. This property has shared bathroom and shared kitchen. There is no reception and the check-in has to be arranged by phone at least 1 hour before your check-in time. Because of the labour laws, for late check in (after 10 pm), we have an extra charge of £ 10.00 per hour, to be paid in cash directly to the staff who give you the keys. If you need airport transportation, you can send a message to +447552566861 with Raffael and check the availability and price!